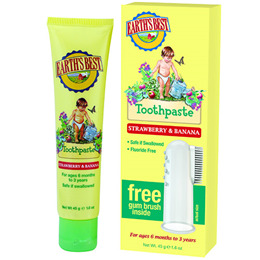 Jason Earth`s Best Strawberry & Banana Toothpaste uses all-natural ingredients like calcium lactate to safely and gently cleanse delicate gums, promoting strong teeth. This toothpaste is made with oat bran, beta-glucan and vitamin B5 which are good for the body inside and out. Deliciously all-natural strawberry and banana flavours encourage brushing. The fluoride-free formula is completely safe if swallowed. Trust Earth`s Best to start your child on the path to a lifetime of good oral health! Aqua (Water), Glycerin, Xylitol, Panthenol, Cellulose Gum, Avena Sativa (Oat) Bran, Beta-Glucan(1), Calcium Lactate, Flavour (2). (2) Natural Strawberry and Banana Flavour. Wash hands and squeeze a pea size amount of toothpaste on gum brush or finger. Use small gentle, circular brushing motions on gums and teeth. Rinse mouth with water. Use daily, especially after meals. Below are reviews of Jason Earth`s Best Strawberry Toothpaste + Free Brush by bodykind customers. If you have tried this product we'd love to hear what you think so please leave a review.